They are super simple to make! Here is how! Cut Foamcare or cardboard to 20″w x 2″t. Place Foamcore across the top of the doubled-up banner, about 2.5″ down. Fold banner over foamcoare, and tape in place. Cut a small hole on each side about 1″ from the corner. Spray the back of the printouts with spray glue. Tie string through the holes. Tablecloths – Get them at your local dollar store! The Star Wars icons are all from the font “SF Distant Galaxy Symbols” which you can download for free. 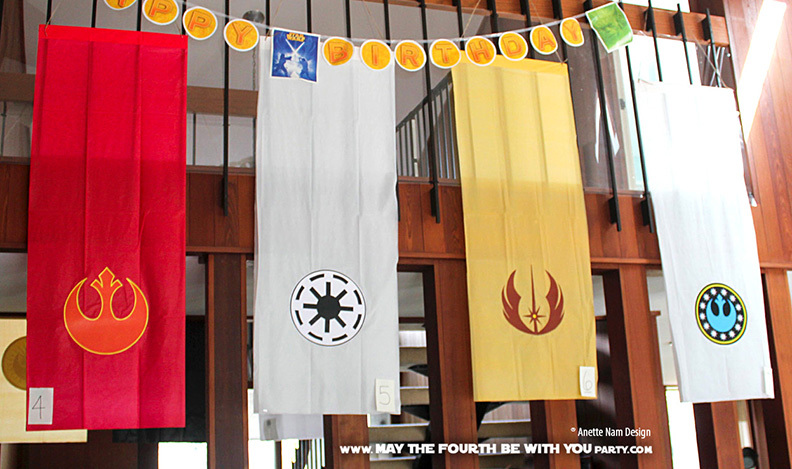 Designs, idea and pattern downloads are courtesy of Jedi Master Heidi.